The weather was beautiful today. I don't just mean there were a few rays,I mean it was actually lovely! So James and I decided to get some fab ice creams and relax as we haven't seen weather like this in such a long time! 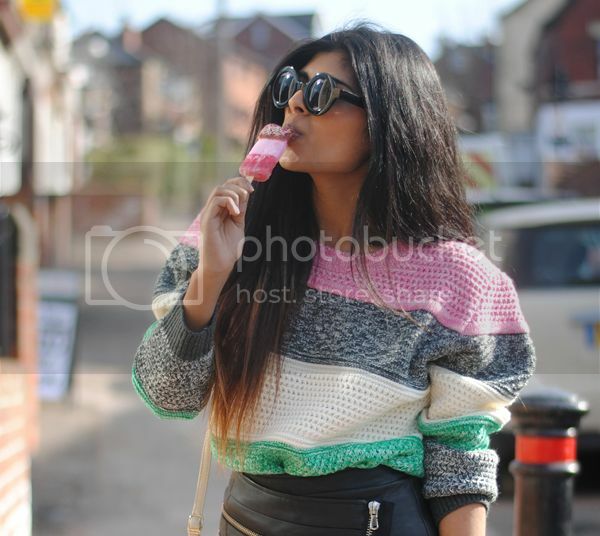 I thought it would have been strange having the ice cream in my hand, as we had just left local corner shop when we thought we may aswell just take photos there and I'd already started munching away - so it just happened! The top really reminds me of Neopolitan ice cream. I know they're not *really* the right colours but still. I still can't stop wearing my style stalker skirt which someone asked me in an email the other day that they wanted it but couldn't fork out the £100 for. Theres actually an amazing lookalike here on sheinside for £30. I don't think it will be as good quality (as I think this is real leather?) but definitely a good substitute! 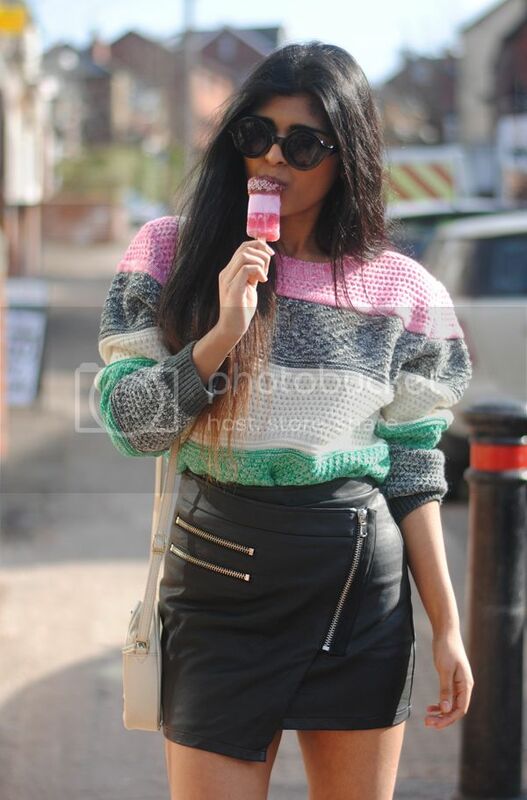 The akirt makes me look a little bit pregnant due to the massive jumper tucked underneath - I promise I'm not! I'm also sporting for the first time on my blog my zara asymetric heel lookalikes! When the asymetric heels first hit the shelves in zara they flew off and then went for £100+ on ebay. I found these amazing beauties on Barratts ages ago for £15 I think or something like that. They're a very very very good copy - such a shame they don't have them anymore! 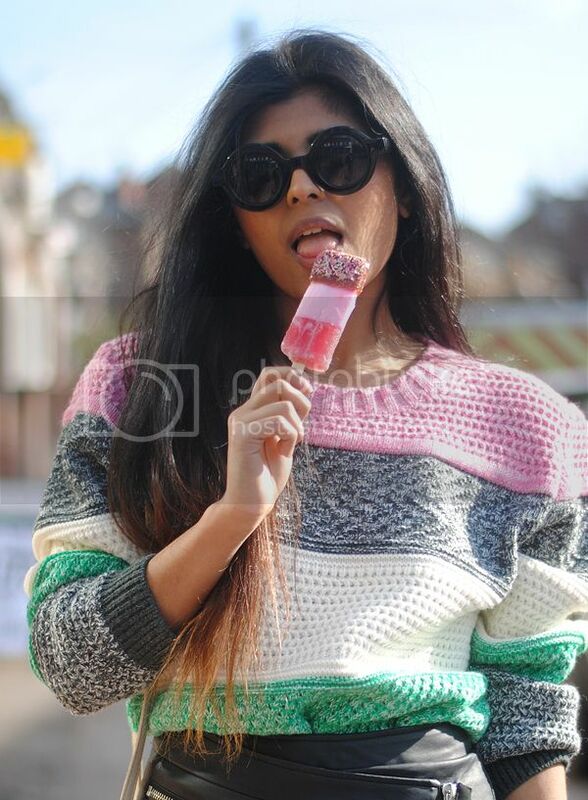 Oh and these wildfox bel air sunglasses lookalikes (all about the lookalikes today aren't I?) Were from my recent (and very extravagant) topshop order! I don't ever buy from topshop, but these are exactly the same shape of my favourite sunglasses, the wildfox bel air sunnies. I couldn't resist, even though for me £16 on sunglasses is pretty pricey! But please topshop - makes these in white too!